Did you get tired of the hotel life? Don't get us wrong, we love room service and maid service, but after a while, you miss the comfort of home even if you have to prepare your own food, do the dishes and pick up after yourself. You miss a refrigerator stocked with your favorite foods and a comfortable place to sit and work. When you're delegated in a foreign country for more than a week, it's very nice to have a sense of home. A long term corporate apartment in Bucharest can offer you extra room, a full kitchen, and a washer and dryer instead of continually sending clothes out for cleaning. And it is especially nice to have an apartment in Bucharest when your relatives visit you during your extended stay. 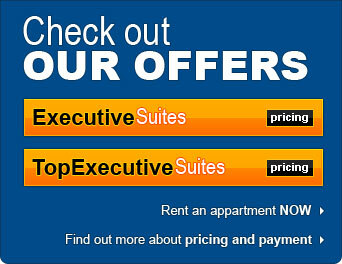 For longer stays, a corporate apartment can be more economical than a hotel. For most clients the break-even point is 14 days. The greatest difference is seen in group accommodation, when many employees from the same company require long term lodging. After all, as a company, you uproot the lives of your people for more than 30 days to go somewhere else and leave their families. Above that, with a stay greater than 30 days,long term corporate apartments are not subject to hotel taxes which can be up to 25% of the room cost in some cases. As a cost calculation, a top executive one-bedroom apartment in Bucharest offered by Corporate Apartments Bucharest rents for EUR 65 per night, while a deluxe suite in 5***** Bucharest hotel lists from EUR 250. The standard of quality inside the apartment is the same or even better; the difference is the position and the entrance of the building where the apartment is situated. We think that for a discount of almost 400% you will find this matter suddenly becoming irrelevant.